A construction crew at work in Kankan, Guinea, as part of UNDP’s efforts to ensure early recovery from the Ebola outbreak. Secretary-General Ban Ki-moon today assured African leaders gathered for a summit in Addis Ababa of the support of the United Nations in helping the countries affected by Ebola “build back stronger than ever,” while the head of the UN development agency tasked with leading the Organization's recovery efforts urged the world to stay the course in aiding hard-hit West Africa. Meanwhile, the Secretary-General, who had tasked UNDP with leading the initiatives of the UN system on Ebola-related recovery, addressed a roundtable on the Ebola outbreak on the sidelines of the African Union (AU) summit which opened today in the Ethiopian capital, Addis Ababa. 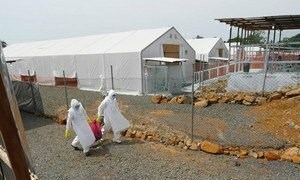 The World Health Organization (WHO) has reported that the number of new Ebola cases recorded last week in the three hardest-hit countries of Guinea, Liberia and Sierra Leone fell below 100 for the first time in seven months, as it announced that the battle against the deadly virus has shifted from slowing transmission to ending the epidemic. “Children need to go to school, farmers need to return to their fields, markets and businesses must reopen,” he added. Saying he was “greatly encouraged by the solidarity shown by Africa – its Governments, businesses and people,” Mr. Ban wished every success in the AU's efforts to defeat Ebola and help the affected countries build back stronger than ever. “I assure you of the United Nations' support,” he said. Meanwhile, the UN Mission for Ebola Emergency Response (UNMEER) reported that the Director of Operations for Humanitarian Affairs, John Ging, visited Sierra Leone, Guinea and Liberia to assess existing emergency coordination structure. There, he met with UNDP and UNMEER colleagues, as well as representatives of non-governmental organizations (NGOs) and other response partners to discuss details of a potential intervention to enhance humanitarian response in the Ebola-hit countries. UNMEER also said efforts were underway to re-open schools in Liberia next week. “Preparation of school infection prevention and control kits to facilitate the safe reopening of more than 4,000 schools in Liberia began in advance of their opening scheduled for next week,” according to the Mission. This week, the number of new Ebola cases recorded in West Africa fell below 100 for the first time in seven months, the World Health Organization reported today as it announced that the battle against the deadly virus has shifted from slowing transmission to ending the epidemic.